Sean Dyche feels the FA’s new retrospective sanction on diving is “weak” and already needs amending. Back in May, it was announced that players who dive or feign injury could face two-match suspensions after the FA voted to introduce retrospective bans, with a new offence of “successful deception of a match official”. Contentious incidents leading to penalties, or opponents being sent off, are reviewed on Mondays by a panel comprising former managers, players and referees, who have to pass a unanimous vote for players to receive two-match suspensions. 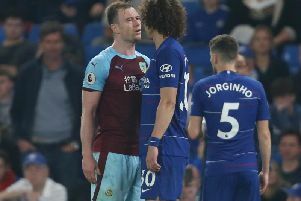 However, the only player punished so far is Carlisle United’s Shaun Miller, and Dyche was surprised to see Watford’s Richarlison go unpunished after winning a penalty against Arsenal, while Bernardo Silva’s exaggerated fall to gain a spot kick against the Clarets last Saturday irked the boss. Silva also walked away scot free on Monday, and Dyche said of the new rule: “It has to be looked at for the moral good of the game, 13 stone, athletic, six-foot international footballers get the tiniest touch on their leg and go down? Do me a favour. “That’s enough to make you go down? “Kids copy professional players, they’ll fall over as well. Can’t have kids cheating, you wouldn’t have them cheating at school. “Without being too pure, if our lads did that, they’d get a little reminder. “But no one cares, I can’t find anyone who’s that bothered about it, managers, the FA have a very weak rule that covers it but doesn’t cover it, the powers that be don’t seem to be bothered, and it goes out to billions of people around the world. “Fans used to care, remember when (Didier) Drogba first came over and there was uproar? Fans, pundits, managers questioning whether they need to have a word.